The plan today was to drive back to Madrid and the airport and stop-over in either Gudalajara or Alcalá de Henares so that we would be close to the airport for the return of the hire car, check in and the late afternoon flight home. We took the road back to the A2 Autovia through several kilometres of road improvement works and as we drove west the weather just kept on deteriorating until the whole landscape ahead of us was smothered by a cold grey blanket of cloud that obscured the view of the great plain of Castile. 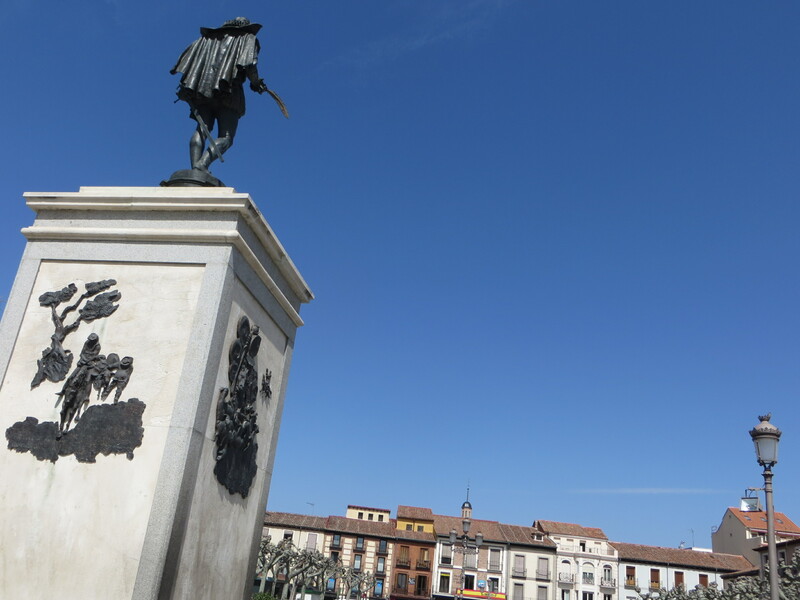 This entry was posted in Cathedrals, Europe, History, Literature, Spain, Travel, World Heritage and tagged Alcalá de Henares, Cervantes, Culture, Don Quixote, Life, Madrid. Bookmark the permalink. Thanks Jo – It really fascinates me that Spain has so many World Heritage Sites! “the world’s first planned university city founded in 1293” – Wow I didn’t know it was in Spain or that it was so long ago! Who’s on the bench with you and Cervantes?